Universal’s upcoming theatrical release “The Secret Life of Pets” promises to show what domesticated animals do when their owners aren’t around. Through its home security products, sister company Comcast is ready to give them a sneak peek. Beginning today, June 20, the television, Internet and home automation provider will launch an integrated marketing campaign using the movie’s characters to showcase the company’s home products and X1 home entertainment system. Among the elements of the campaign: a television spot that — much like the movie’s premise — gives owners a sneak peek into what their pets do when they’re not around. The spot begins with a number of owners saying goodbye to their pets, and leaving their homes. They check in periodically on the pets from smartphone apps and laptops to find them first doing cute things (eating tissue paper or barking at a mirror) to slightly more destructive activities (like making popcorn in a blender). One pet is shown accessing Comcast’s X1 Entertainment System on TV. 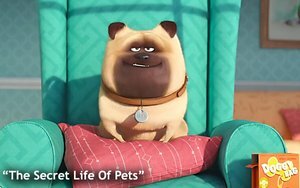 Comcast has also geared its voice-remote to respond when people bark, meow or tweet like a bird to go directly to original “Secret Life of Pets” content, including alternate scenes, character bios and film information. “It’s all the stuff you’d find online, but we put it in one place,” Arata says. In addition, Comcast will host smart-home tours and screening ins 12 markets before the movie officially opens on July 8. The tours will take selected customers and influencers through a tricked-out smart home showcasing all of the home security and automation devices and connected platform. After the tours, the groups will head to screenings where there will be more information and giveaways.